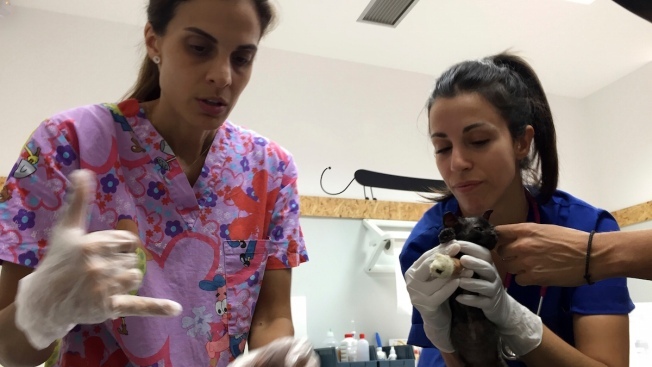 Veterinarians Iron Mavraki, left, and Meni Tsakalidi treat a cat that suffered burns and other injuries in Pikermi, east of Athens, after a wildfire swept through popular summer resorts near Athens and claimed the lives of more than 80 people. At least 83 humans perished in this week's ferocious wildfires near Athens, Greece. Area residents who fled the advancing flames couldn't bring pets to hotels where they relocated. Most rescued pets at the clinic have yet to be reclaimed by their owners. The kitten lay on the ground so perfectly still that passing volunteer rescuers had initially written her off as just another of the many victims — human and animal — of this week's ferocious wildfires near Athens.